(Nanowerk News) Action-packed science-fiction movies often feature colourful laser bolts. But what would a real laser missile look like during flight, if we could only make it out? How would it illuminate its surroundings? The answers lie in a film made at the Laser Centre of the Institute of Physical Chemistry of the Polish Academy of Sciences in cooperation with the Faculty of Physics at the University of Warsaw. Tests of a new compact high-power laser have given researchers at the Laser Centre of the Institute of Physical Chemistry of the Polish Academy of Sciences and the Faculty of Physics, University of Warsaw (IPC PAS and FUW) the opportunity to film the passage of an ultrashort laser pulse through the air. The film shows the journey of a light projectile at an extremely slow rate, similar to that watched on cinema screens by science-fiction aficionados. "If you wanted to film a single light impulse to move as slowly on film as in our recording, you would have to use a camera operating at a speed of a billion frames per second", says Dr. Yuriy Stepanenko, leading the team responsible for the construction of the laser. Cameras recording billions of frames per second in one sequence do not exist. In order to film the travelling laser pulse, researchers from the Laser Centre of IPC PAS and FUW used an earlier known trick. A suitably adapted camera was synchronised with a laser generating laser pulses at a rate of approx. 10 shots per second. It was done in such a way that with every subsequent pulse the camera recorded an image minimally delayed than previous one. "In fact, a different laser pulse can be seen in every frame of our film", explains Dr. Pawel Wnuk, (LC of IPC PAS and FUW) and adds: "Luckily, the physics always stays the same. So, on the film one can observe all the effects associated with the movement of the laser pulse in space, in particular, the changes in ambient light depending on the position of the pulse and the formation of flares on the walls when the light passes through the dispersing cloud of condensed water vapour". The laser pulse, lasting a dozen or so femtoseconds (millionths of a billionth of a second), was generated by a laser constructed at the Laser Centre of IPC PAS and FUW. It was so powerful that it almost immediately ionised the atoms it encountered. As a result, a plasma fibre – filament – was formed alongside the pulse. By appropriately selecting the operating parameters of the laser, to permit a balance of the complex interactions between the pulse's electromagnetic field and the plasma filament, the laser light beam did not disperse in the air, conversely, it underwent self-focusing. This meant that the pulse could effectively move a much greater distance than low-power pulses, whilst maintaining its original parameters. "It is worth noting that although the light we are shooting from the laser is in the near infrared range, a laser beam like this travelling through the air changes colour to white. 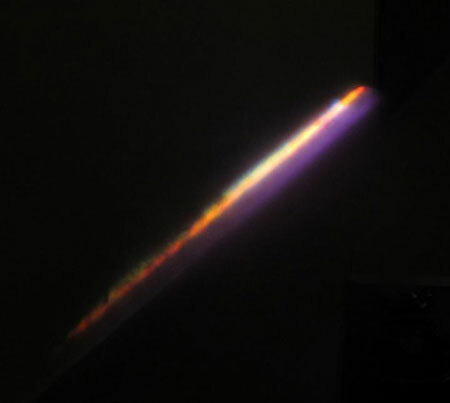 This happens since the interaction of the pulse with the plasma generates light of many different wavelengths. Received simultaneously, these waves give the impression of white", adds Dr. Stepanenko. The ability of the light pulses from the new laser to penetrate the atmosphere over long distances is a feature that the Warsaw researchers made use of when demonstrating LIDAR, a device that can be used for the remote testing of atmospheric pollution. The fact that the pulses generate white light during passage is an important advantage in this context. Light at different wavelengths interacting with the atoms and molecules in the air is able to provide a far greater wealth of information. This means that LIDAR constructed using the new laser will be able to detect a larger number of elements and compounds polluting the atmosphere. 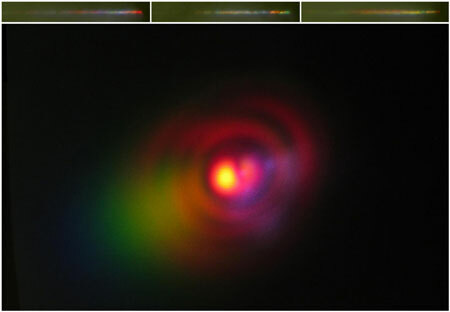 Photos and films of the ballistic laser pulse and plasma filaments were shot during testing of the compact laser generating femtosecond pulses with a power of over 10 terawatts, constructed at the Laser Centre of IPC PAS and FUW. The innovative device uses the direct transfer of energy from the pump laser beam to the reinforced beam. Due to the effects of nonlinear optics the light is amplified hundreds of millions of times on a distance of just a few centimetres with over 30% efficiency, which is outstanding among devices of this class. The multi-pass optical parametric amplifier NOPCPA (Noncollinear Optical Parametric Chirped Pulse Amplifier) used in the laser was designed in-house and Prof. Czeslaw Radzewicz and his team have been developing it in the Laser Centre of IPC and FUW since 2005.